Turmeric Curcumin is known as the Golden Spice of Life! One of the healthiest and most important dietary supplement on the planet, it is known to improve your health and positive well-being. It’s not only a natural anti-inflammatory but is also known for it’s role in increasing circulation and optimal joint health and mobility. A true anti-inflammatory, it is also rich in antioxidants, lowers risk of heart disease, helps arthritis, amongst so much more. Because of increased circulation, it is also known to help make your skin more glowing and healthy-looking. The perfect boost for your body! Bio-curcumin® with BCM 95® health supplement is a powerful formula made from a strategic blend of natural ingredients. It is specifically designed to help boost and support the body’s internal systems and maintain health in a natural way. Regain your health by using the most scientifically tested ingredients that nature has to offer. Many natural health practitioners swear by Curcumin, claiming it has anti-inflammatory and antioxidant properties. Experts believe these properties make it ideal for fighting the damage caused to our bodies by free radicals and inflammation as we age. Bio-curcumin is clinically proven to be one of the most bio-active Curcumin extract in the world. Because of its many advantages, BIO-CURCUMIN® is a market-leading product and its proven benefits are already being enjoyed by millions people all around the world. Bio-curcumin is a unique blend of the most active and potent compounds of Turmeric, notably, Curcuminoids and Ar-Turmerone. Bio-Curcumin® exclusively uses only actives from Tumeric, there are no artificial additives commonly used to increase bioavailability in turmeric supplements. Bio-Curcumin is 100% nature based. 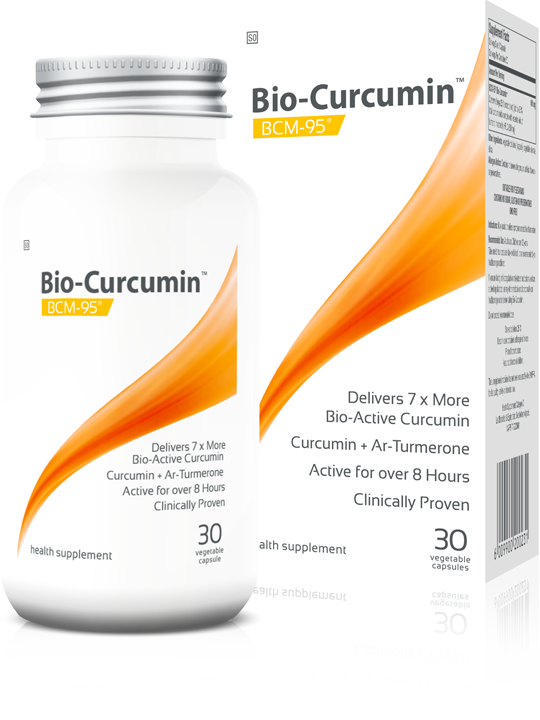 Bio-curcumin with BCM 95®has a concentrated formulation of natural Curcumin and Ar-turmerone, which are the most potent components of turmeric. This gives the product its unrivalled level of oral bioavailability. Has enhanced oral bioavailability and retention of Curcumin in blood, even after 8 hours. BCM 95®combines micronized Curcumin with Ar-turmerone for clinically validated greater potency and effect. 100% natural with no artificial additives. Efficacy scientifically documented by pre-clinical and human clinical trials with more than 33 clinical studies in national and international journals – plus 13 international patents. Many Curcumin products claim to have improved bio-availability. But, the results are often flawed, as they tend to measure total Curcumin absorption, which includes metabolites and in-actives. They also contain artificial actives and processes in an attempt to increase bio-availability. In recent tests, Scientists around the world, have confirmed that only “FREE CURCUMIN” is active within the body for maximum efficacy and health benefits. You can TRUST Bio-Curcumin® to be the best and most bio-available Curcumin extract. Supports the immune system and many other bodily processes. Zinc is essential for normal skin, vision, smell, taste, reproduction, brain development, protein synthesis and wound healing. It is also one of the most important factors in a healthy immune system. Zinc is involved in just about every aspect of the immune system, including the immune system enhancing “T” cells that are necessary for immune system response.